Create a fabulous candle lit glow on your event tables with these beautiful lanterns. Guests will feel the warm welcome you are extending to them as they take their seats. 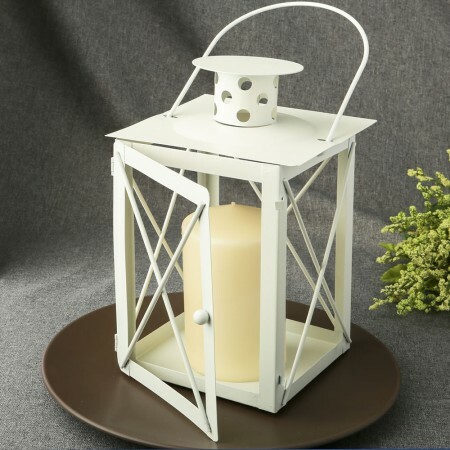 This lantern is constructed of all metal and has an ivory coated finish. The design has 4 sides with ivory metal criss-cross rib supports. On the front panel is a hinged door with a knob. By pulling the knob, you can open the metal tabs that lock the door in place. This allows you to easily open and close the door and place decorations or a candle inside the lantern without having to take it apart. The classic turret-shaped top has a flat circular cover and holes for ventilation. Attached to the top is a convenient and sturdy metal handle that connects through the top and hooks onto the sides of the lantern. The base inside is flat, ideal for holding decorations of your choice or a lovely candle. •Size 9 1/4" x 5 3/4" x 5 3/4"